Wisdom of Life. 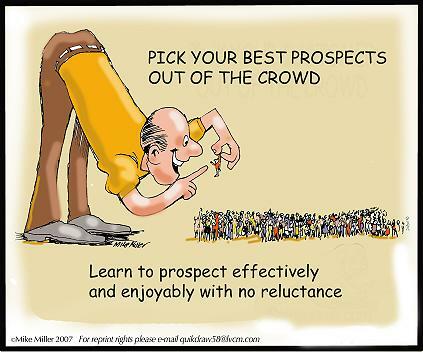 : Prospecting makes simple in selling. On every case before my actual presentation, i requested a promise from all my potential customers. The promise is: Buy my plan if you think it is useful to you. But if for any reasons they could not pick up the insurance, they have to pay for the cost of my time. The cost is to recommend two of their friends to me, who might benefit from our products. Unless they agreed to my option or request, i would not continue my selling. I just had to stare straight on their eyes for an answer. Believe me...No one said 'No'. This selling system helped me to save a lot of time without prospecting further. If a new client bought my plan, he became my good friend eventually. If those prospects didn't pick up anything from me, they added on with another two new prospects. The spin over effect was tremendous. Do i still practise this selling system? No because selling life insurance is my hobby now when my existing clients are proud to introduce all their friends to me. Why? Because i talk wisdom into their lives. I always keep this in mind - "You cannot fail at prospecting unless you fail to prospect" - David Sandler.